Some good deals to be had! I disagree. The Argos deal for 200 led lights for £5.99 today trumps anything in this Tesco sale. They're reduced by 50%, or they have 50% off. They are reduced by UP TO 50% off. No. They are reduced by UP TO 50% off. Nope. They're reduced by up to 50%. "Off" is superfluous. It's probably unfair of me to call you out like that, so yeah, my bad for being a grammar nazi, but I keep seeing it everywhere and it's starting to grate, soz. Nope. They're reduced by up to 50%. "Off" is superfluous.It's probably …Nope. They're reduced by up to 50%. "Off" is superfluous.It's probably unfair of me to call you out like that, so yeah, my bad for being a grammar nazi, but I keep seeing it everywhere and it's starting to grate, soz. ‽ There you go. Had to look it up though, learn something new every day. Fair point, but what are you referring to? Thank you. I was able to copy and paste from your post. Now have to work out how to get shortcut back. Been this price for ages, just another fake RRP to pretend it's an "incredible 50% off sale!!!" Yeah, been this price for a good while I thought. So Tesco have ‘reduced’ the price of their Christmas lights at Christmas. So when do they sell them at full price then? Summer? Some good deals to be had!I disagree. The Argos deal for 200 led lights …Some good deals to be had!I disagree. The Argos deal for 200 led lights for £5.99 today trumps anything in this Tesco sale. Plus 3 for 2 offer so get 3 sets for the price of 2 sets at £11.98. This is an absolute joke. 240 led in argos £10 and 3 for 2. Same pack in tesco £12 half price. What morons are voting this hot? Electricity price now comes into play!! Buy packs of batteries for a pound from Poundland (who'd have thought!!) and use with Argos lights. Plug in to mains power and use mains leccy for Tesco variant - not free. Extra £5-6 from Tesco buying price = 5 to 6 packs of batteries. Guess most would use these over Chrimbo only so how many packs of batteries would actually be required? Thanks for giving your time to help others. It will never be a good deal for everyone but thanks from everyone who used it. Anyone seen the outside icicle lights a good price?! Thanks for this. Just bought 200 multi-coloured. I've read it and re-read it, no gramatical or spelling errors there. so yes, I have to ask. Enlighten me! This is an absolute joke. 240 led in argos £10 and 3 for 2. Same pack in …This is an absolute joke. 240 led in argos £10 and 3 for 2. Same pack in tesco £12 half price. What morons are voting this hot? Electricity price now comes into play!! Buy packs of batteries for a pound …Electricity price now comes into play!! Buy packs of batteries for a pound from Poundland (who'd have thought!!) and use with Argos lights. Plug in to mains power and use mains leccy for Tesco variant - not free.Extra £5-6 from Tesco buying price = 5 to 6 packs of batteries. Guess most would use these over Chrimbo only so how many packs of batteries would actually be required? One alkaline AA battery contains about 2.6 Wh (0.0026 kWh) of electricity. Assuming mains electricity costs about 15p per kWh that's about 0.04p per battery. So you'd have to get 2500 AA batteries for £1 at Poundland for the energy cost to be comparable. Maybe it doesn't matter if you just plan to use the lights for one Christmas then throw them away, but most people re-use decorations. I've read it and re-read it, no gramatical or spelling errors there. so …I've read it and re-read it, no gramatical or spelling errors there. so yes, I have to ask. Enlighten me! One alkaline AA battery contains about 2.6 Wh (0.0026 kWh) of electricity. …One alkaline AA battery contains about 2.6 Wh (0.0026 kWh) of electricity. Assuming mains electricity costs about 15p per kWh that's about 0.04p per battery. So you'd have to get 2500 AA batteries for £1 at Poundland for the energy cost to be comparable.Maybe it doesn't matter if you just plan to use the lights for one Christmas then throw them away, but most people re-use decorations. My HND electronics really couldn't be bothered but at least you made your point!! 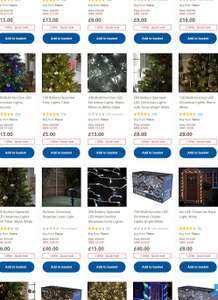 Although I note that there is no mention of the actual purchase price of both sets of lights? I wasn't comparing mains power to battery power as you have above, I was saying you may get sufficient power out of a few £1 pack of batteries to warrant the less expensive (circa half price) battery lights from Argos. I look forward to your thoughts on power consumption of both the sets of lights as this is the relevant point after all. Home Bargains is way cheaper than this deal. Voted cold.